Just two years before the revolt of 1857, there was another revolt in North India against the British. On one side were tribes fighting with bows and arrows and on the other were the British and their agents, the Zamindars with the latest weapons. Sadly, this great Santhal Revolt, fought in the jungles of Jharkhand and West Bengal finds just a one-line mention in our school history books. Not only was this an uprising of great importance, the root cause behind it, the rights to tribal lands, became the basis of a more recent and deadly movement that continues to fester- the infamous Naxalite movement in India. History truly is a continuum and it is important to understand the past, to make sense of the present. The Santhals are a tribal community inhabiting large parts of Jharkhand, West Bengal, Bihar and Odisha. They speak Santhali language and worship their own gods. Till the 18th century, Santhals lived in the thick forests of the region and practiced hunting. However, political events far away would have significant impact on their lives. After the Battle of Plassey in 1757 CE, the control of Bengal passed to the British East India Company. A large chunk of the area inhabited by Santhals came under British rule. Soon the British began to clear the forests in order to grow cash crops such as jute, poppy and indigo. This was followed by the introduction of the famous ‘Permanent Settlement’ or the Zamindari system by Lord Cornwallis in 1793 CE. Under this ‘settlement’ it was agreed that landlords would have perpetual and hereditary rights over the land, so long as they paid a fixed revenue to the British Government. To create this new breed of Zamindars, the British auctioned away large tracts of land belonging to the Santhals, to anyone who would guarantee them these fixed revenues. A lot of rich Indians based in cities bought zamindaris in these far off forests and pretty soon, started exploiting people there. With the introduction of the Zamindari system, the Santhals lost all rights to their land. They were reduced to hired labourers working in the fields for these new ‘landlords’. This also brought to an end, the old tribal systems and political structures that had continued here for generations. The Zamindar and his men were in control. Another great blow to the Santhals was the introduction of currency. Santhals followed the barter system, but the Zamindars had to be paid in cash. This meant that they had to borrow money at very high interest rates from money lenders. The tweezers grip of money lenders and the loss of identity, created a deep sense of resentment among the Santhals. As years passed things got worse. 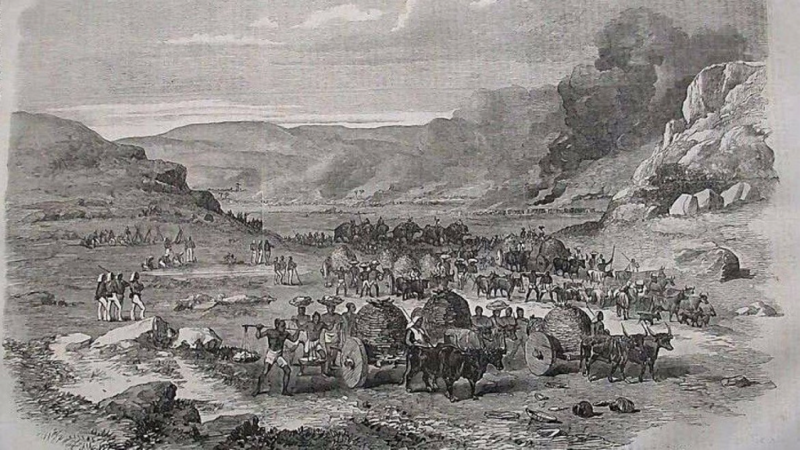 The exploitation at the hands of the local zamindars and the British led to an armed revolt. 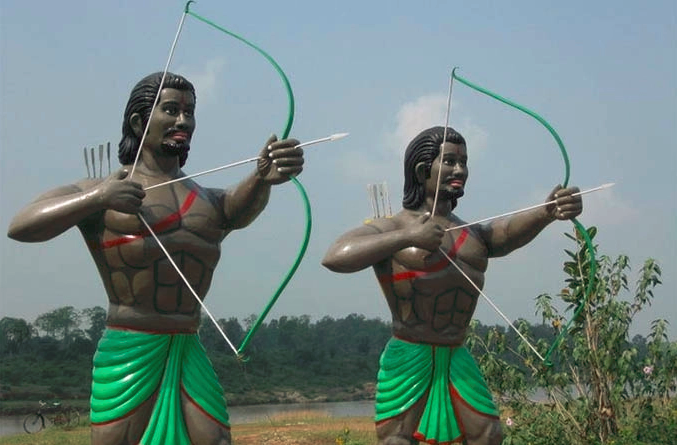 The Santhal rebellion of 1855 CE was called Hul, which in the local language means a movement for liberation. The rebellion was headed by the four brothers of the Murmu clan – Sidhu, Kanhu, Chand and Bhairav and their two sisters Phulo and Jhano. 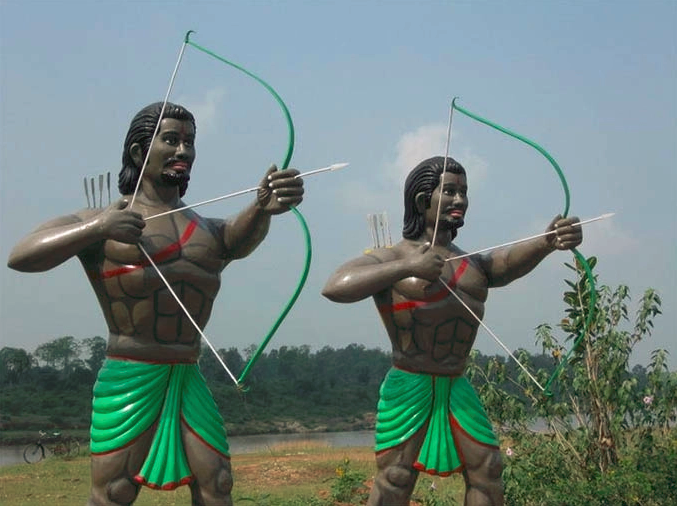 Born in a clan of Santhali priests , they lived in the village of Bognadih in Sahibganj district in Jharkhand. One day in June 1855, Sidhu Murmu claimed that he had a divine revelation that oppression can only be overthrown by armed rebellion. The brothers sent emissaries across Santhal lands with Sal (Shorea robusta) branches as a secret form of communication. On 7th July, 1855 CE, a huge number of Santhals assembled in a field in Bhognadih village. They declared themselves free and took an oath under the leadership of Sidhu Murmu and Kanhu Murmu to fight till their last breath against the British and their agents. This act of the Santhals sent alarm bells ringing and the British sent a police agent who tried to arrest the brothers. The Santhals reacted violently to this and killed the police agent and his companions. This triggered a series of conflicts between the English East India Company’s army and the Santhals leading to a full-fledged war. The Santhals captured a large tract of land extending from the Rajmahal Hills (in Jharkhand) to Bhagalpur district (in Bihar) to Birbhum (in West Bengal). The rebels decided to drive out the money lenders and Zamindars. 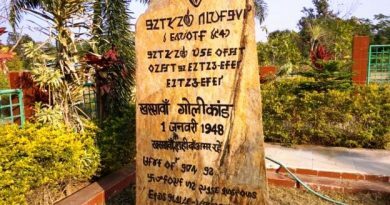 There were killings on both the sides and the local British administrators sheltered themselves in the fortification in the Pakur town of Santhal Pargana to save their lives. The Santhals were passionate and fierce warriors but they didn’t stand a fair chance against the sophisticated firearms used by the English East India Company. It is estimated that between 15,000 to 20,000 Santhals were killed by the British. The brothers Sidhu and Kanhu, were among the casualties. Even though the rebellion was suppressed within a year in 1856 by the Company, few pockets of Santhal resistance continued till 1857. While the Santhals were defeated, this revolt did propel the British authorities to acknowledge their follies. The Santhal Paraganas Tenancy Act came into being which provided the tribes some protection from colonial exploitation. The regular police force was abolished and the village headman was vested with the duty of keeping peace and order. The Santhal revolt of 1855 was beautifully portrayed in the 1970s, by Kolkata based filmmaker Mrinal Sen who made a movie called Mrigayya. Sadly, even now, 70 years since India’s independence, problems continue to fester. The Santhals continue to take up cudgels against the authorities and their frustrations have deep roots. Like in 1855, the Santhals are unhappy about losing control and the rights over the land they feel is part of them. 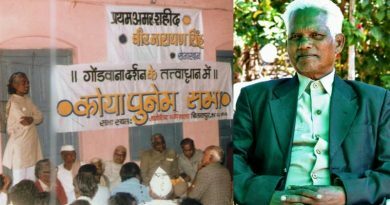 A Santhal, Jangal Santhal (along with Charu Majumdar and Kanu Sanyal), was part of the core team that started the Naxalite movement (named after Naxalbari, a village in West Bengal) in 1967. Decades later, caught up in politics and allegedly funded and armed by external agencies the Naxalite movement bears little resemblance to what it started out as, leave alone the Santhal Revolt of 1855. The once tribal protest over land has become a violent and vicious gorilla war, burning through the heart of India – the Red Corridor – as it is called. Thousands of innocent people have been killed in a battle that seems nowhere near an end! The article has been republished from https://www.livehistoryindia.com/snapshort-histories/2017/07/14/the-forgotten-santhal-revolt-of-1855. This post has already been read 2763 times! I came from the same part of the northern India where Santal Hul took place and belong to the same tribe Santal as the leaders of Santal Hul Sido and Kanhu Murmu. But with good fortune I managed to come to UK and domiciled there.